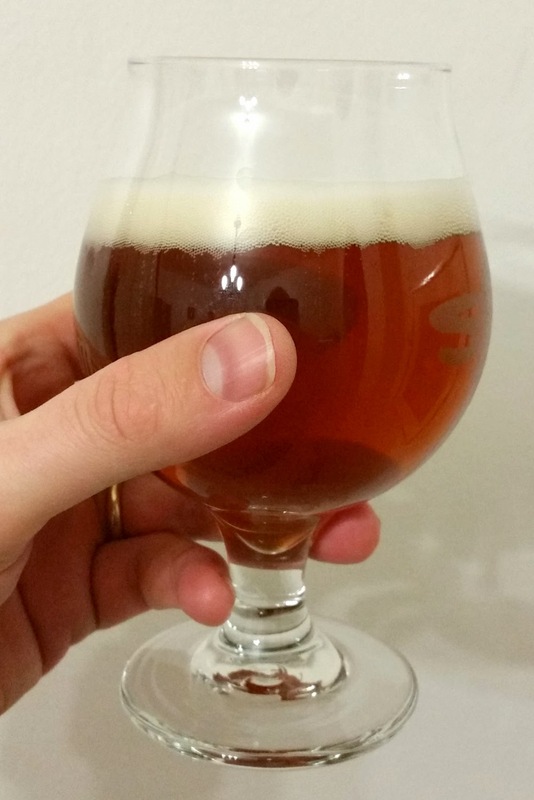 Before this beer got too far along, I wanted to do a critical tasting of my pumpkin ale. I’ve only got a few bottles left, and have been enjoying these through the winter months. Pumpkin ales (and pumpkin spice anything) are a bit of a trend these days, which has resulted in no shortage of commercial examples that (in my taste opinion) range from mediocre to delicious. Not one to dodge a beer bandwagon, it seemed like a good idea to brew one. As you’ll see below, yes, it was a good idea! Thick off-white head with excellent staying power; a creamy appearance and feel to the head. The beer itself is brilliantly clear, with a rich golden hue (the picture really doesn’t do it justice). This is about as beautiful as it gets. Hard to describe, in a good way. Very lightly malty, with a pleasant but not overwhelming bitterness. I definitely pick up the nutmeg–distinct, but not overpowering–but the cinnamon is much more subtle; basically, just a little zing on the finish. Perhaps a touch overcarbonated. That aside, the mouthfeel is pretty smooth, just as I’d hope for something with pumpkin. Absolutely! I might dial back the carbonation just a notch, but otherwise this is pretty much the perfect pumpkin ale. The vegetable, malt, and spices are well balanced, and the body is full enough that it’s not like a lager with spice added. This recipe is going into the yearly rotation. I’ll also note that it has aged very well, and is just as tasty (if not more) after two months. This entry was posted in pumpkin ale, tastings. Bookmark the permalink.